We are the leading manufacturer, supplier and exporter of a huge variety of alloy wheels that can fit any kind of wheel. These are manufactured from state of the art technology and high grade raw material to provide a durable wheel. These are in high demand from our valued international clients and are supplied at competitive rates. - Sizes: 16" to 24"
Assisted by a qualified workforce and advanced manufacturing unit, we are engaged in offering a wide range of Alloy wheel. 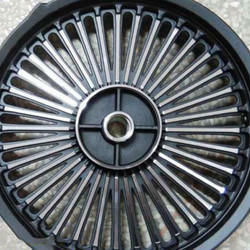 The provided wheel is manufactured using premium quality material and latest techniques at our vendor’s end. Additionally, our provided wheel is processed adhering to industry standards and quality norms. We are one of the leading organizations engaged in offering a wide range of Alloy Wheels, which enhances driving comfort and adds style to the car. It is manufactured using quality material, which is obtained from authentic vendors based across the market. Our range of Alloy Wheels is helpful in improving the braking efficiency and provides enhanced cooling to disks & drums.arter. We are offering a wide range of Alloy Wheels to our customers. Alloy Wheels For all bikes. - Single-piece wheel wherein the disk and rim are welded together. - Wheels for both tube and tubeless tyres. - Services provided for wheel and tyre assembly. - Expertise to offer light-weight wheels using micro-alloysteel, thereby incorporating ultrahigh strength and product life. To meet the various requirements and needs of our clients, we are highly occupied in offering wide spectrum of Alloy Wheel. These alloy wheels gives appealing look to vehicle and add style. The provided range of alloy wheel is manufactured at ultra modern production unit using best quality raw material and latest technology. - The Alloy wheels are the one which exhibits richer look for the vehicles but these are susceptible to pothole damage and develop cracks or dent. - When alloy wheel is bent then instead replacing new wheel the bend or the dent can be worked on to make it straighten.